I grew up in a decade in which young people distrusted anyone over thirty. I grew up with a president vilified by much of America. I grew up in a town where people cursed and lied and hid secrets in broad daylight. I grew up on the back lots of movie studios where the wholesome television shows like The Waltons and Happy Days were filmed. I knew those shows were make-believe, and that the war protesters and bra burners I saw on television were the real America. But despite growing up surrounded by all that paradox, I was still brought up to believe in the basic moral compass of our country and the decency and goodness of every single human being. I still believe in both the basic moral compass of our country the decency and goodness of every single human being -- even when our purported leader expresses foul unpresidential opinions in foul unpresidential language. Opinions that make me want to tell every person whose skin color or country of origin is in opposition to this administration that this is NOT the America in which I grew up. This is NOT the America in which most of us still live. My mother grew up in Wales, England, China, and Canada. As a teenager, she dreamed of coming to the United States — and after she did, she never stopped believing that this country was great because it allowed people like her to get a new chance to live in freedom. 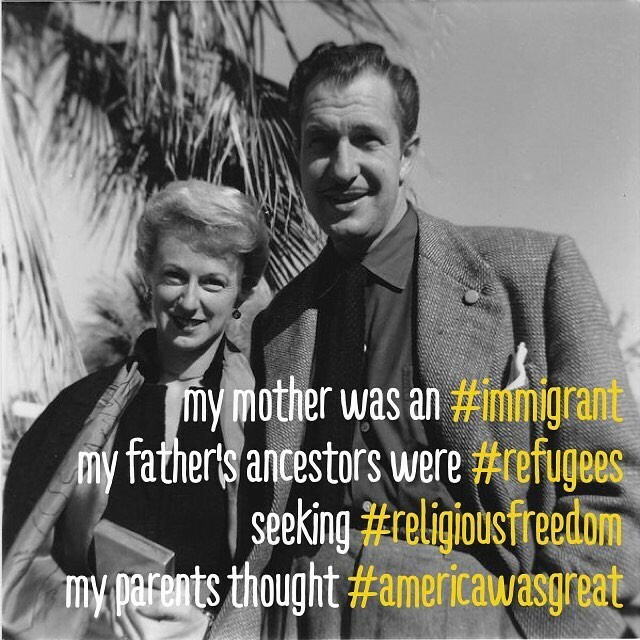 My mother was not a perfect person, but she never stopped finding ways to give other immigrants the same opportunities that she had. Yesterday our president used the kind of language to express the kind of narrow-minded judgmental jingoistic opinion that children used to be taught was beneath people of substance. Now our children are being taught that to judge, bully, tweet, discriminate and hate is a normal daily occurrence. What can the rest of us do about this? "Who'll be my role model now that my role model is gone?" Me. You. We have to be our own role models. AND we have to be role models for future generations -- so that they know that this is NOT okay. To do that, we have to take a good long hard look at ourselves in the mirror. Can any of us honestly say that we have not judged others in inappropriate language for reasons we thought perfectly justifiable at least once in our lives? I certainly can't. Sure I want to say that our president is behaving abominably, but the fact of the matter is that I, too, am far from perfect. Recently I was reading about the fall of the Roman Empire. There are many theories about why the greatest empire in the history of the world went into decline -- the rise of Christianity, the debauchery of the Roman emperors, the aggression of marauding neighboring tribes from the North. But at the end of the day, it came down to the people themselves. The Roman citizens were inculcated to believe that both aggression and excess were the norm -- and their own expectation and expression of both soon came to be their daily norm. Aggression breeds aggression. Excess breeds a more-is-better mentality. An empire exudes an us-against-them and we-are-better mindset. It's a slippery slope to extinction from there. We are on that slippery slope. Not just America -- but the whole planet. And if we are going to turn things around -- each of us has to hold ourselves to a set of higher standards. So, essentially, if we are all interconnected in inter-being -- each of us has the opportunity either to be and to see one another as fellow shitholes, or we have the option to be and see one another through the eyes of Love. So today, on a day when I could be deeply disheartened by the state of the world -- the further decline and fall of basic human decency -- I am going to create a new daily practice of joy that will hold myself first to a higher seeing. Although I am deeply humiliated by the bellicose and divisive rhetoric of our world, I choose instead to be taught by it -- to refute the bellicose and divisive rhetoric within myself. How do I do that? I start right where I am. A few seconds ago, I heard a gunshot. Right here, right now, how do I think about the people whose lives are immediately impacted by that gunshot? Are those people dangerous shitholes or are they fellow human beings caught in the crosshairs of a society that is teaching violence. Do I choose Love or do I choose fear? Do I choose Love or do I choose hate? Right here, right now, in every moment, we have a choice about how we think about others. Today, I vow neither to be a shithole, nor to view others as current or prospective shitholes. Rather, I choose to practice open-hearted acceptance, open-minded seeing, and to do my best, every single day, to love our interconnected world whole. Will this be easy? No. But we have no other choice. We can shithole ourselves and one another into oblivion. Or we can all choose Love. It begins with us, and it ripples out from here. Let us all look ourselves in the mirror and choose to learn to love ourselves, one another, and this whole beautiful world back whole. Right here. Right now. Today. Choose Love!